Three Niles West debaters, Nathan Glancy, Nasim Salehitezangi, and Elizabeth Bennet, have been named to the University of Michigan’s summer fellowship program for the summer of 2017. The prestigious J. W. Patterson Foundation fellowship, which is awarded to only twelve high school juniors each year, is a seven week debate program that takes place each summer on the University of Michigan campus in Ann Arbor, Michigan. 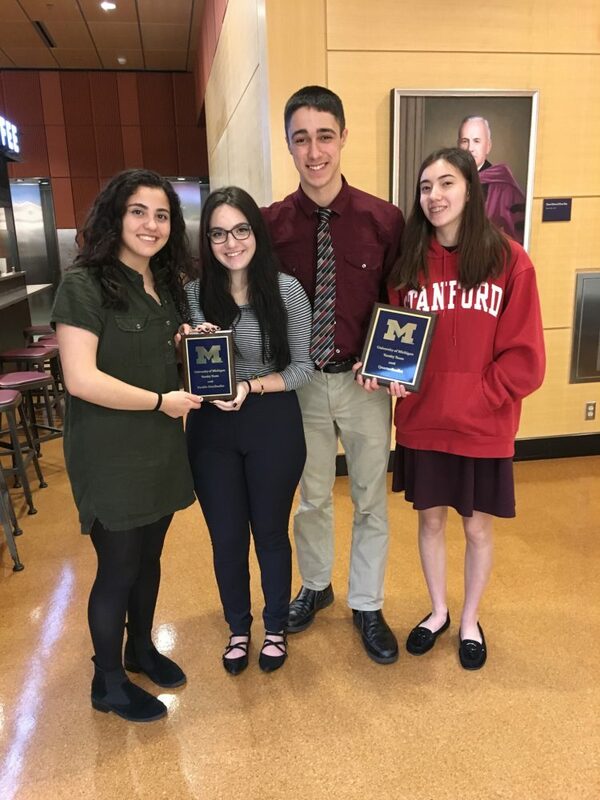 “The fellowship award, or the fellowship, is an honor society where the University of Michigan recognizes the best debaters who are upcoming high school seniors for their achievements and their future potential as a debater,” Glancy explained. Glancy and Bennet, who are partners, both have high hopes for their senior year, which will follow a summer spent immersed in debate. “It’s really nice to have my partner awarded a fellowship as well because it shows that as a team we’ve both been doing really well and gaining a reputation,” Bennet said. Salehitezangi, who is partnered with senior Emily Silber, is already anticipating the prestige that fellow debaters will soon associate with herself and her teammates as a result of the fellowship. Like her teammates, she is also resolved to gain recognition for herself and Niles West. Bennet and Glancy explained how honored they felt to have their hard work recognized. “It allows me to feel like I’m being recognized for all the hard work that we’re putting in as a team, and it really helps establish a future for Niles West debate,” Glancy said. For Salehitezangi, it was a major goal for this season. For head coach Eric Oddo, the selection of three Niles West students for the fellowship indicates that their team has once again reached the elite level of years passed. Wonderful article, Grace. Kudos to Nasim, Ellie and Nate!